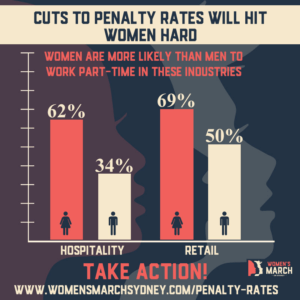 In June 2017 the Fair Work Commission announced a decision to cut Sunday penalty rates across hospitality and retail. 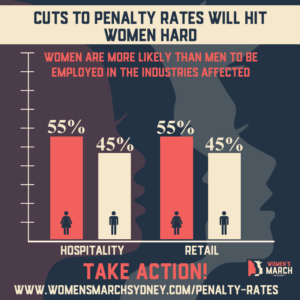 In hospitality, penalty rates will fall from 175% to 150% on Sunday and in retail they will fall from 200% to 150% for full and part-time employees and to 175% for casuals. 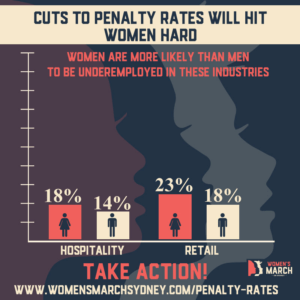 Cuts to penalty rates will hit women hard. Women hold 54.6% of all retail jobs and 54.7% of all hospitality jobs. In both of these industries, women are more likely to be employed part-time, to be underemployed, and to have no paid leave entitlements. The Australia Institute has warned that the penalty rates decision could mean that 285,000 workers will lose an average of $2,744 a year from Sunday penalty rate cuts. They have also warned that penalty rate cuts could come at a cost to the budget of $650 million due to reduced personal income tax revenue and a rise in claims for welfare payments. Finally, they have warned that the cuts could worsen the gender pay gap. 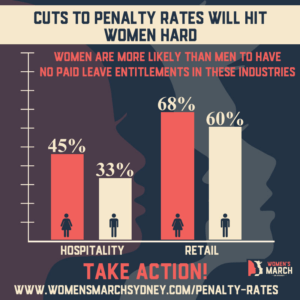 Women working in retail and hospitality can not afford a pay cut!